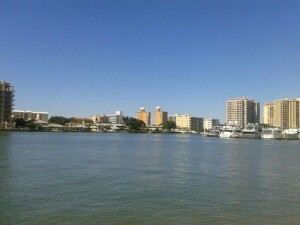 A view across the Bay at Downtown Sarasota. Downtown Sarasota combines the best aspects of a major metropolis and a small town into one unique, culturally rich Gulf coast city. A smaller corporate business district allows local businesses to thrive, while also diversifying the downtown scene. While the majority of residential housing in the “main” part of downtown is high rise condo buildings, there are wonderful communities that are still considered part of downtown Sarasota. These communities feature condos, as well as single family homes. The heart of downtown Sarasota starts at Marina Jack, a waterfront venue on Sarasota Bay that offers a fresh and delicious menu, breathtaking views of downtown and the Bay, a full service marina for your boat, and much more. The area around Marina Jack in the downtown section of Sarasota promotes health and wellness as the bay front is lined with a bike and walking trail that goes from Palm Avenue, along the bay, and over the Ringling Bridge. Whether you want to walk, run, or bike, you will enjoy tremendous views of Sarasota Bay, the passing boats, and a panoramic view as you cross the Ringling Bridge from downtown into St. Armands Key and Lido. 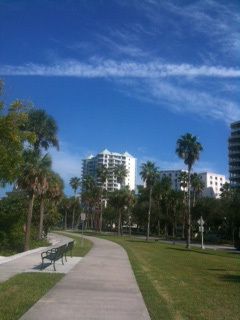 Go for a walk or a jog on the trails along US-41, into Bayfront Park, or across the Ringling Bridge. Awaiting you a few blocks inland are the wonderful streets of downtown Sarasota. A stroll down Main Street and you will find some of the best shopping and dining in the area. Fantastic boutiques, jewelry stores, art galleries, pet stores, salons, and spas are at your disposal to get you ready for a night on the town. Main Street also provides numerous cafes, bars, lounges, and restaurants that are sure to satisfy your tastes. Another great feature in downtown Sarasota is the farmer’s market that is held on Saturday morning. Residents line the streets, selling produce that is grown locally. The rich culture of downtown Sarasota is unparalleled to any other city in America. The smaller size of the city is very appealing and the close proximity to the beach makes downtown Sarasota a very desirable location. 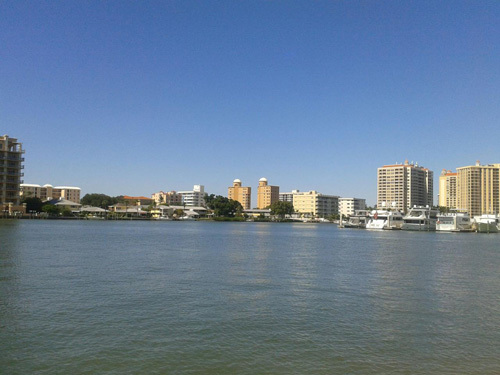 Whether you are looking to relocate to Sarasota, move to a new and exciting location in the county, want to find a place for retirement, or are looking for a place that you can use as an investment property, you will find what you need in downtown Sarasota. For more information about real estate in Downtown Sarasota, please contact Suncoasteam Realty 941-235-7474 or sales@suncoasteam.com.